We spend a lot of time hanging together down by the creek. We play and we explore there, never really with much of a plan. Our story times often unfold while we sit together doing nothing much more than just watching and listening. We call to the river to tell us a story, and then we look around, and listen carefully to find it. The story then appears in a natural and collaborative way between myself, the children and the place we are in. A few weeks ago, after a morning of delightful unstructured play and wandering down by the creek with my 4 year old daughter, we sung our Story-calling Song to the river, and then it answered in a most delightful way. One of those rushes of wind came hurtling up the river from a distance and when it blew by us, little leaves swirled all around us. There was a story there, but what was it? It sure wanted to be told. My daughter listened for a moment before saying that it wanted to tell us the story of the swamp hen. We didn’t know what the story was yet, and so we watched the swamp hens nearby so that we could find out. 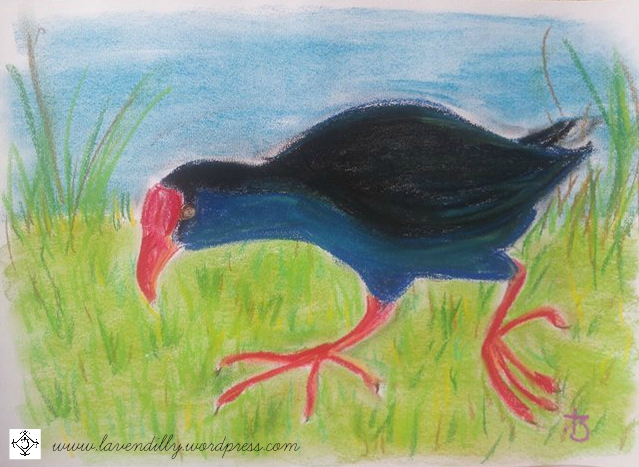 The swamp hens were stepping carefully with their long toes on the lawn near the bank, and digging with their red beaks in the grass. Stepping and digging, stepping and digging. Their purply and deep blue feathers shone in the sun. Unhurried, peaceful, purposeful. Other hens were paddling in the water, and one dived right under and disappeared for a moment before shooting out of the water again like a rocket. We found this most interesting! And so we started talking about what we saw, and why we thought the swamp hens were doing these things. My daughter had a lot of theories about what these waterbirds were doing. We wondered why they were pecking the grass – she thought they were eating the “moisture” (moys-cha), which, it turns out, she thought was lovely dark dirt. I wondered, if maybe they might be nibbling at some roots or grubs that live in the “moisture”. We wondered how they could swim when they were birds – she thought they must kick with their long toes. We wondered why the swamp hen whooshed out of the water so quickly – she thought the eels might have bitten it on the nose because it had been rude. AH! That explains why it has a red beak! And there we found the story. It just came, and we told it while we tried to copy the swamp hen’s movements. Have you stepped like waterbird? Stepping slowly while lifting knees and pointing toes at the same time takes balance! When we got home we looked up swamp hens in our bird book and on the computer and discovered that they DO eat the grasses and soft roots of plants near the river, and they DO sometimes attack eels (known as jurun in Yugambeh Language) – but no one knows why. Purple Swamp Hen was swimming in the shallow water of the river, looking for some food. It dived down under the water and swam about for a moment, before popping back up for a breath. It was a beautiful bird with shiny, purply and dark blue feathers, and long, long toes that it could use to pick up food, or to swim for short distances under water. It was a neat bird, a tidy one, and it liked the way its sleek feathers glimmered in the sunlight. Swamp Hen stepped carefully so that it would never get dirty. This boasting from Swamp Hen made Eel so cross, it rushed forward and bit Swamp Hen on the beak. Swamp Hen got such a fright it whooshed straight out of the water like a rocket! Its poor beak was bright red and sore! And that is why Swamp Hen now much prefers to spend its time stepping carefully and only using its beak to dig in the softer parts of the grasses and plants that grow by the water. Sometimes when its beak is feeling really red and sore, it uses its toes to lift up soft plants and shoots, rather than to bend down and dig. And it never spends long underwater, in case it meets Eel again. 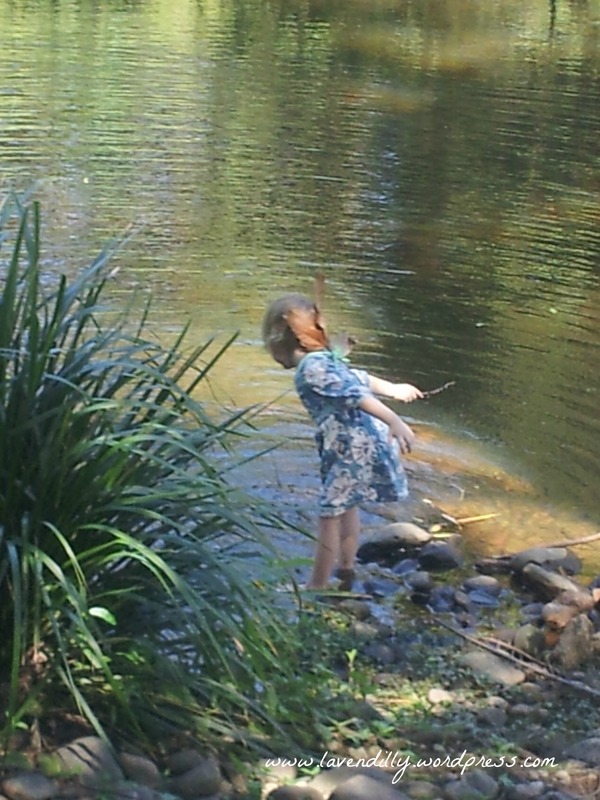 A lovely story – creeks are such great places to hang out and watch the world. This is a delightful story and describes the nature of these often comical birds well. The story could quite easily be adapted to dance for performance.